Some of the best value Irish food is served up daily in pubs all around the country. Its simple food, locally sourced thats cooked well, if you are lucky. A great money saving tip is to have whatever daily special is on the board between about 12 and 3pm. Often a 'roast' of the day and a fish option. Country people still like 'to get the dinner in the middle of the day' and market towns especially cater for farmers appetites so portions will be generous with plenty of vegetables and potatoes, brown bread and butter on the side and possibly even chips as well. 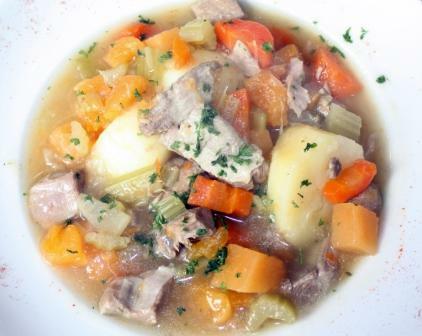 Irish stew is heart warming comfort food, available most places for about €10. Traditionally made from lamb pieces stewed slowly with carrots, onions, celery, potatoes with a handful of barley thrown. It is quite sweet and lighter then Guinness Stew which is made from beef pieces and vegetables stewed in Guinness but without the barley, about the same price. Bar 8 Dock Rd, belonging to Sheridans the cheese people, absolutely excellent food and decent glasses of wine. Blue Cafe The Harbour, Skerries an old school mate of mine John Nealon, has been in the pub business since he was born and knows what its about, nice fresh twist though? Caffreys Oldcastle, County Meath. The next best thing to the Mammy's roast dinner, served all day, with homemade sticky toffee for pudding. Davy Byrnes 21 Duke St, just off Grafton Street, Dublins most famous literary pub mentioned by Joyce in Ulysses, Guinness & oysters and lots more. Fallon & Byrne Exchequer Street, a wine bar, you choose your wine from the celler depending on what you fancy on the menu or the other way round? Olde Castle Bar & Red Hugh when you are in the wilds of Donegal (town) it easy to crave hunting, fishing, shooting kind of fare, you will find it here from venison to fish pie. Smugglers Creek Rossnowlagh, Donegal, the view is the main att-distraction its so wild out. The Irish stew has won world titles and would feed several pirates. The Abbey Tavern Howth, County Dublin on the go since the 15th century,turf fires, flagged floors and gas lights, manys as wonderful lunch I have had here. The Roundwood Inn Roundwood, County Wicklow there isnt a better fireside to sit beside in the middle of winter with a nice bottle of red, with a plate of venison stew. 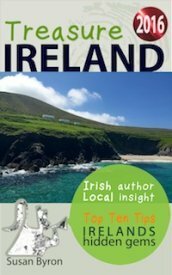 Vaughans Anchor Inn Liscannor, great pit stop if you are visiting the Cliffs of Moher, perfect pints, good homely meals and proper puddings.